Anthotypes are the ground zero of Slow photography, yet despite long waits for results, the swift passage of time is brought sharply into focus. Flowers bloom and fade, sometimes within the space of just one day, every sunny hour is an opportunity not to be missed. Working with this beautiful process has honed my appreciation of the garden’s fleeting moments. 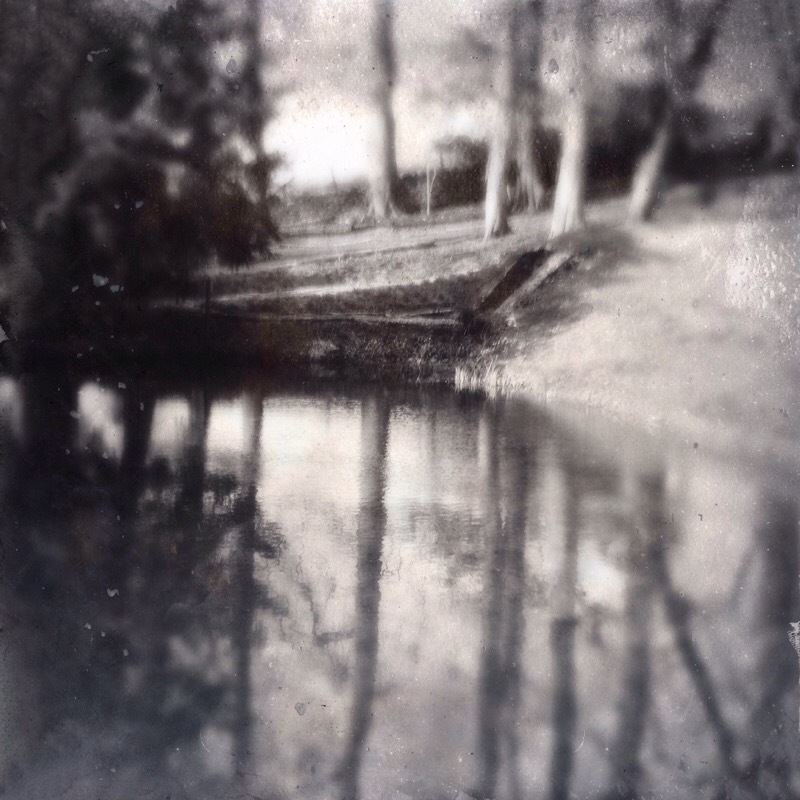 These two Anthotypes capture rippled reflections on the pond at Painswick Rococo Garden, holding them for just a little longer, before they vanish forever. 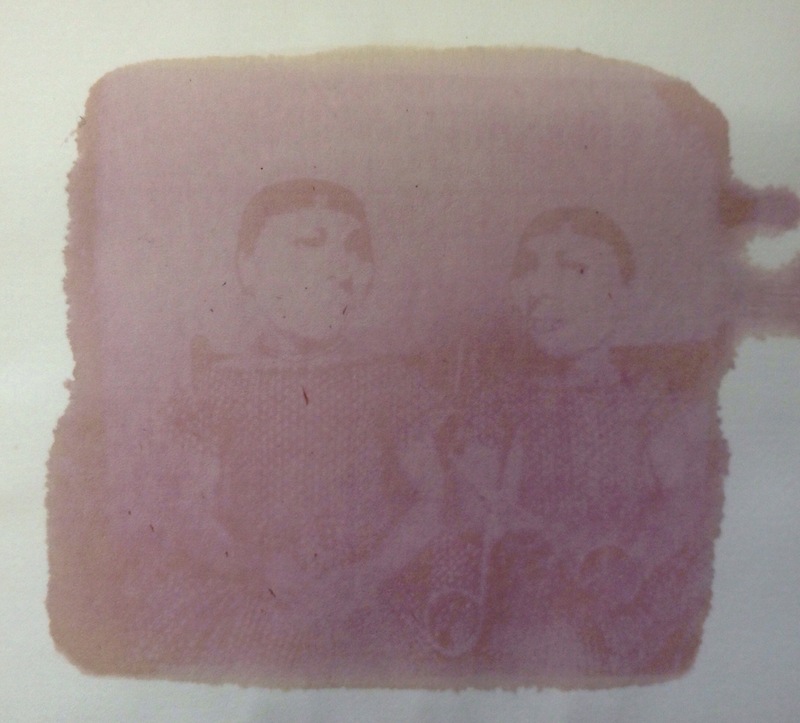 Anthotype prints made with Sweet Pea petals from Painswick Rococo Garden and Tamarind Berries from a garden in Rome. Sunlight from my garden in Cheltenham, Gloucestershire. This entry was posted in Uncategorized on June 26, 2015 by lumilyon. I don’t know this lovely woman’s story, although she and her family have been my my life for thirty years, since I purchased a bag of anonymous photographs at Kettering market. 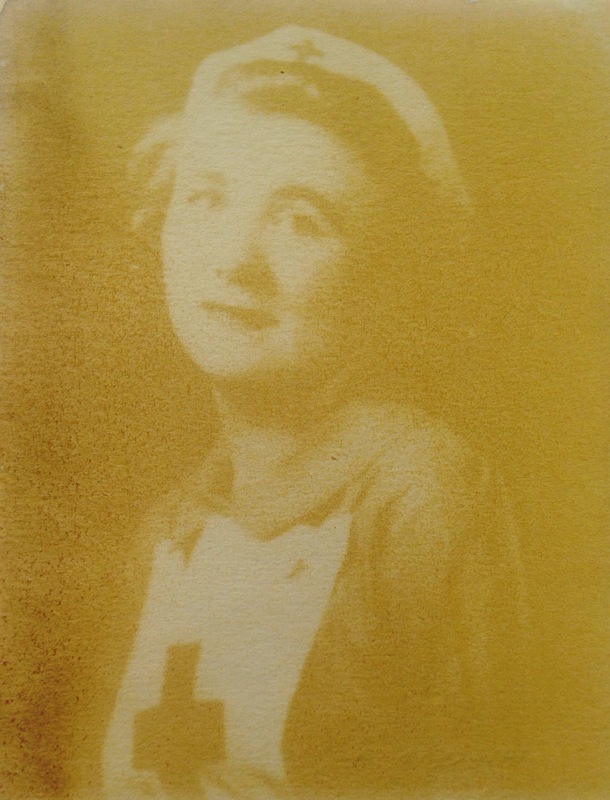 However, Cynthia wrote a dedication to her grandmother on the back of the photograph of which this Anthotype is a copy, so at least I know her first name. This entry was posted in Uncategorized on June 22, 2015 by lumilyon. Snowdrop leaf Anthotype made with Snowdrops and Spring Water from Painswick Rococo Garden and Sunlight in my Cheltenham garden. 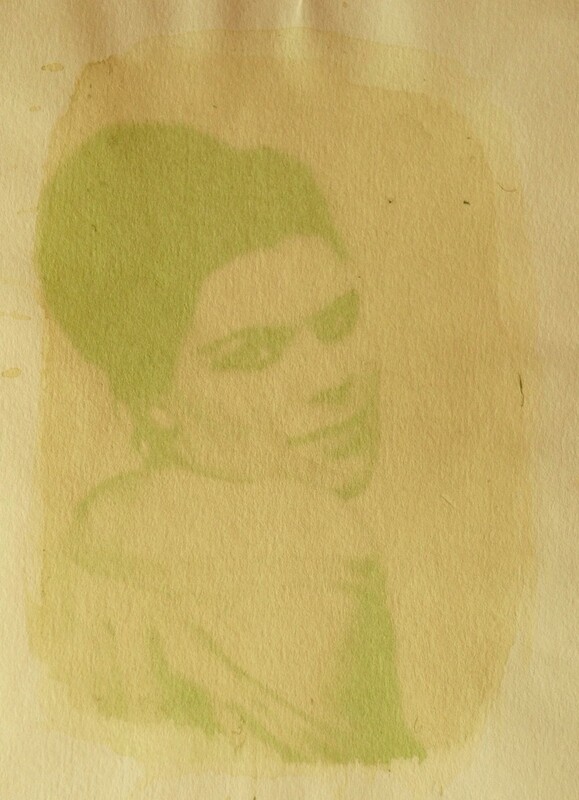 I’ve been very productive today and now have six Anthotypes sunbathing in the back garden. Having finally plucked up the courage to use one of my precious snowdrop leaf papers, I was rewarded with the most delightful surprise. 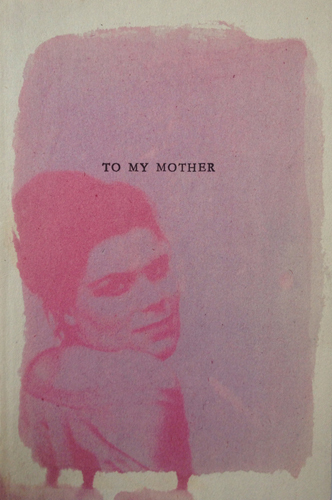 It took just five hours to make this print of my mum. Of course, It’s impossible to capture the shimmering colours of Anthotypes and so what you see here doesn’t do justice to the zingy leaf-greens of the real thing. The darker tone could almost be described as lime. My mum never wears green because she considers it unlucky, but I think she looks very pretty indeed! This entry was posted in Uncategorized on June 4, 2015 by lumilyon. 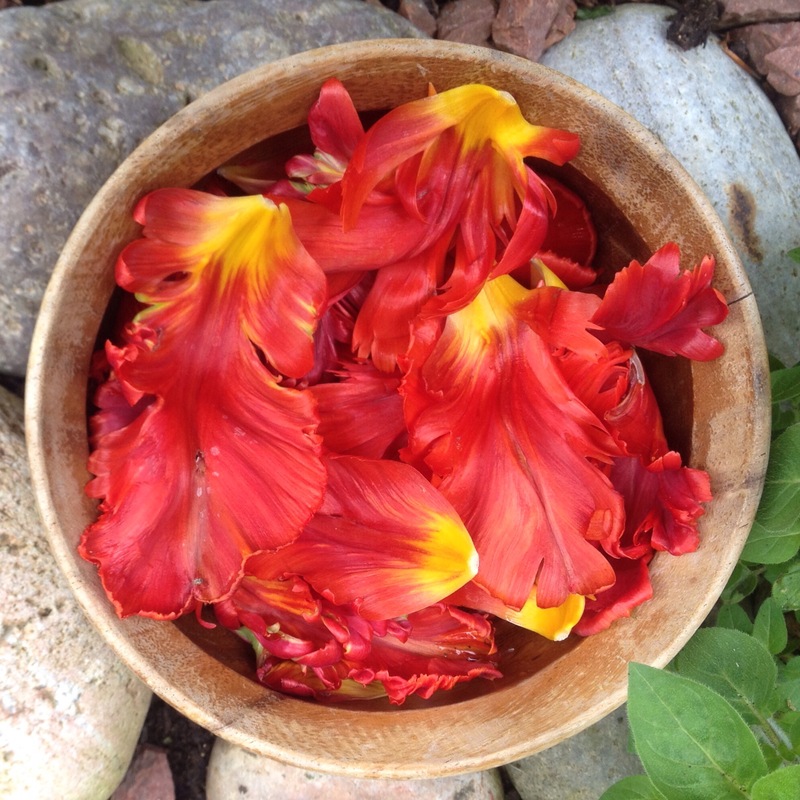 Last week, Jasper Johns, one of the gardeners here at Painswick Rococo Garden, gathered up and put aside some fallen petals from the Parrot Tulips that are growing in a border next to the chilly Plunge Pool. These are particularly spectacular specimens and if you’ve visited the garden recently, you will have almost certainly admired their exotic gorgeousness: flame-red with fine green and yellow markings, their deep-cut petals have a frilly, frothy fringed look. They are aptly named “Rococo”, so what could be a more perfect flower for a Rococo Garden Anthotype? Delighted as I was to receive Jasper’s thoughtful gift, not everyone was happy. Several visitors to my Bothy studio have gasped in horror at the sight of me cutting up such beautiful flowers, even when I explain that they have been saved from the compost heap. The tulips have yielded some surprising colours, ranging from deep pink-mauve to purple, depending on the paper. The Anthotype below was left out in the Kitchen garden yesterday, whilst around it, gardeners and volunteers toiled in the hot sun, weeding and planting. By 5pm, I had a reasonably good exposure so although it is not my most successful print to date, I decided not to push it any further as the paper had been coated with just two layers of rhubarb-pink coloured dye, of such delicacy that I feared any more sun would bleach the image away completely. 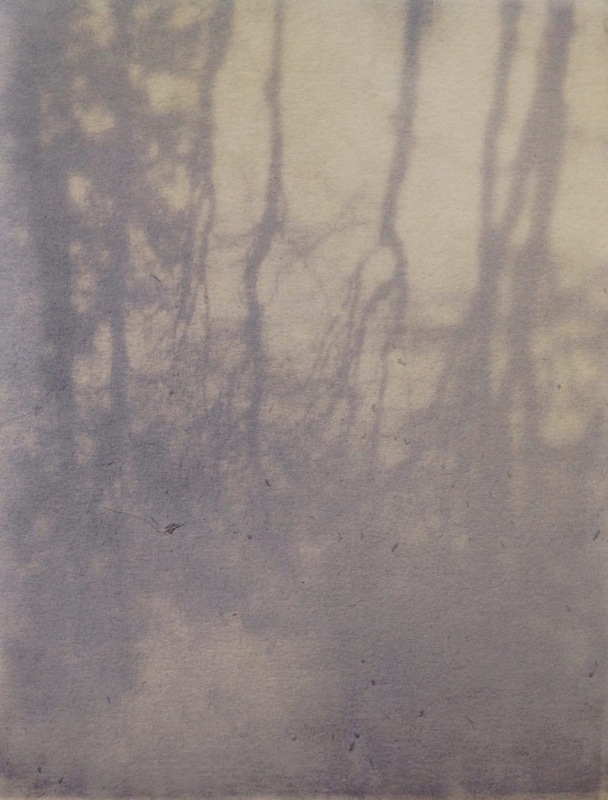 Currently, I have examples of my Anthotype work in two exhibitions: Capturing Light at the Silverprint Gallery in London, features work by a number of contemporary artists who are exploring Alternative Processes as are those featured in Taking Time which is closer to home, at Ruskin Mill, Stroud. This entry was posted in Uncategorized on May 14, 2015 by lumilyon. This entry was posted in Uncategorized on May 11, 2015 by lumilyon. 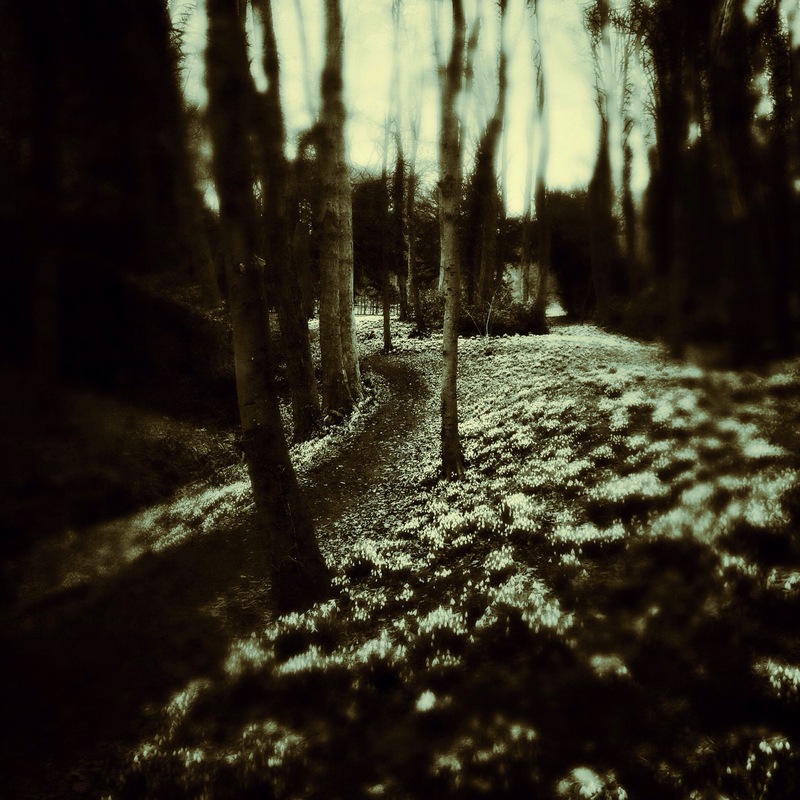 Each year, during Late January and February, hundreds of people visit Painswick to enjoy the magnificent swathes of Snowdrops for which the Rococo Garden is famous. 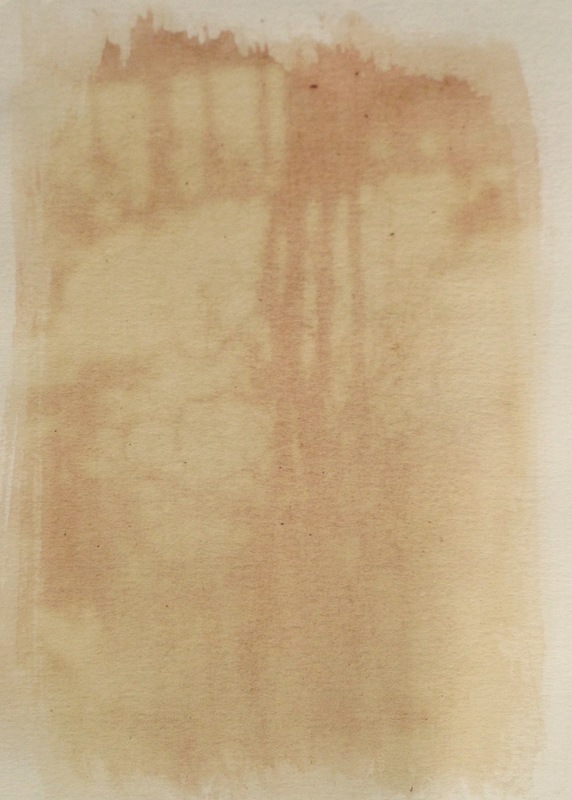 I began my residency here last April, so I’ve had to wait for nine months before I could begin to explore the potential of Snowdrop leaf Anthotypes. 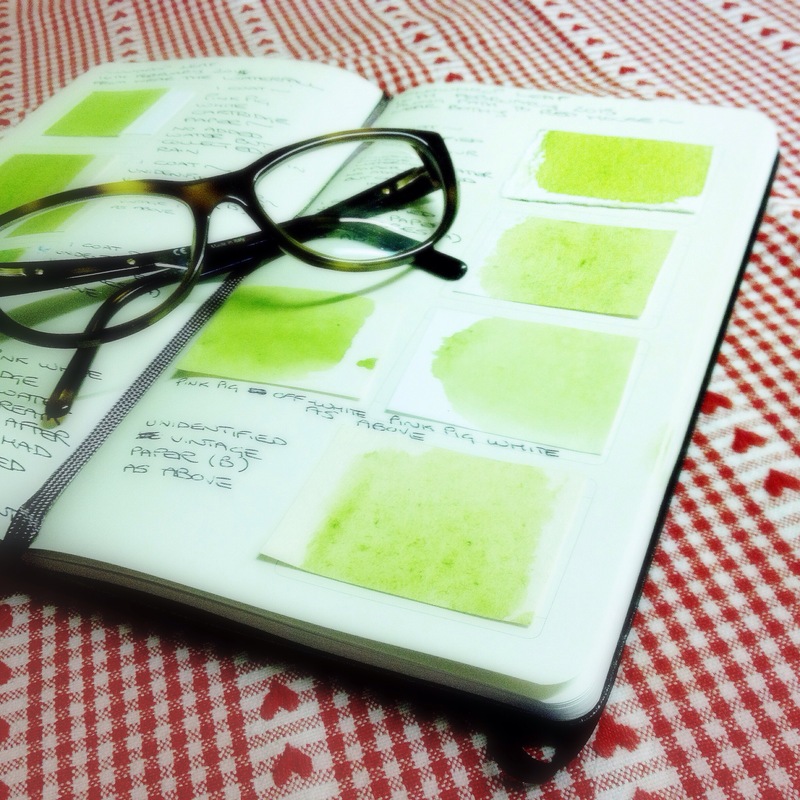 Today I began my experiments and am delighted to write that my colour swatches show great promise. When crushed, the leaves emit a delightfully fresh scent that reminds me of pea pods. As I’d collected them in the rain, I didn’t add water for these first samples. The dye is a pretty Spring green of good opacity. One coat may well be enough. Later this week, I’ll be back in the garden to coat some papers with delicious Snowdrop dye, but I must be patient for a few months more because it will be late March before conditions are right to begin my first exposures. A couple of weeks ago, I was paid a visit by Garden designer and writer Non Morris. She has written a beautiful blog post about her Winter trip to Gloucestershire. It can be found here. This entry was posted in Uncategorized on February 16, 2015 by lumilyon.